I am very happy to attend the very first-ever Philippine Sports Tourism Awards last November 22, 2016 held at Resorts World Manila, the Awards recognized events, destinations, local government units, national sports associations, private companies, and event organizers who have contributed to the growth of the local sports tourism industry. The awardees were selected by a panel of judges which included, Philippine Olympic Committee Board Member and Chairman for Women in Sports Cynthia Carrion–Norton, Philippine Sports Commission Chairman William Ramirez, DOT Undersecretary Benito Bengzon Strategic Works, Inc. director for public relations Mark Parlade, and Charles Lim of Selrahco Management. 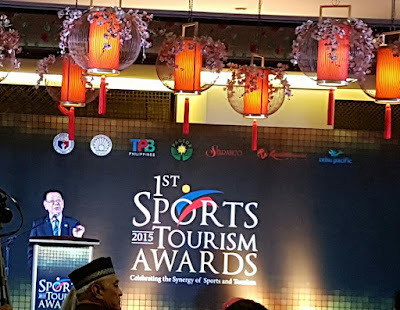 Organized by the Philippine Sports Commission, Department of Tourism (DOT), Tourism Promotions Board Philippines, and Selrahco Management, the Awards attracted hundreds of nominations from across the country but only nine programs were distinguished for their efforts to develop and promote the Philippines as a sports tourism destination. Clark Freeport Zone, Pampanga was named the Sports Tourism Destination of the Year for hosting various sports tourism events, including racing competitions, car shows, Frisbee games, and the widely attended Philippine Hot Air Balloon Fiesta that welcomes around 112,000 local and foreign visitors yearly. 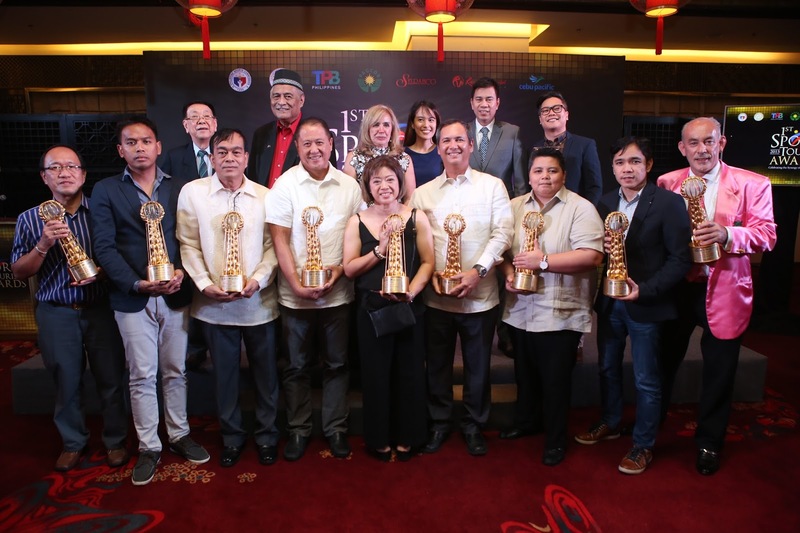 The Municipality of Lubao and Sunrise Events, Inc. also took home individual trophies as Organizer of the Year in the public and private sector categories, respectively. Both winners have held events that boosted local sports tourism as a viable industry in the Philippines. Cebu’s Tabuelan 111 won in the Event of the Year-Domestic category, for its successful tri-event races held in celebration of the town’s fiesta. Ironman 70.3 Philippines, meanwhile, took home the award in the Event of the Year-international events category. The Philippine Inter-Island Sailing Federation, which popularized boat races in the country, was named Sport Association of the Year. Ironman 70.3’s campaign to make Cebu a global sports tourism destination won the Destination Marketing of the Year award. The Philippine Rugby Football Union and Hong Kong-based civic group Pot Bellied Pigs Rugby Club’s Fat Boys 10s Rugby was hailed Charity Event of the Year 2015 for delivering medical assistance to 1000 kids annually through funds generated from annual golf and rugby tournaments. Resorts World Manila Golf Masters, which catered to the event broadcasted to over 200 countries, took home the Event Sponsorship Award of the Year 2015. This professional golf tour is touted as the richest tournament in the Philippines, with a US$1-million prize money. 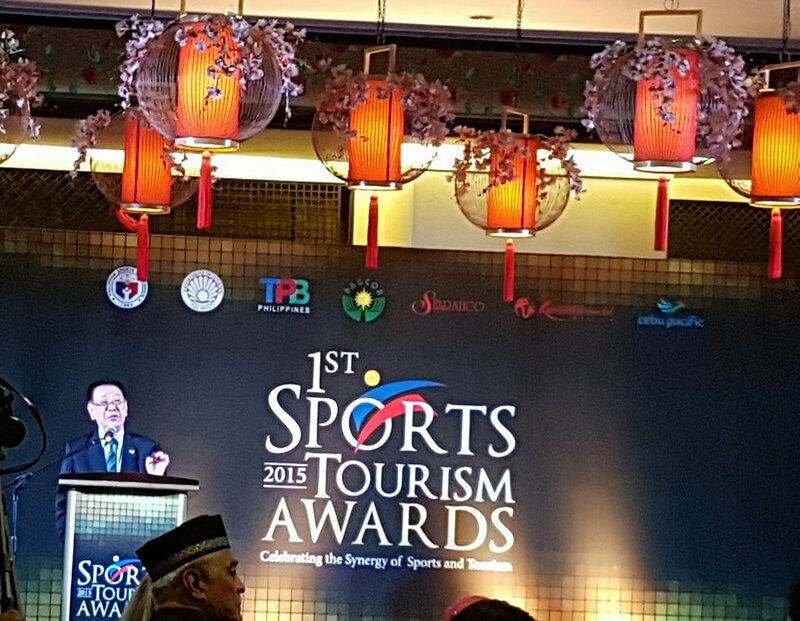 Champions of sports tourism standing side by side for the first Philippine Sports Tourism Awards. PSTA organizers Resorts World Manila Kathy Mercado, Philippine Amusement and Gaming Corporation Mr.. William Ramirez, Sports Tourism Forum & Philippine Sports Tourism Awards founder Charles Lim, Department of Tourism (DOT) Secretary Wanda Corazon Teo, DOT Undersecretary Benito Bengzon, Cebu Pacific Ms. Jacquline Gorospe, and director of PR agency Strategic Works Mark Parlade. Standing in front of them are the first set of PSTA awardees. 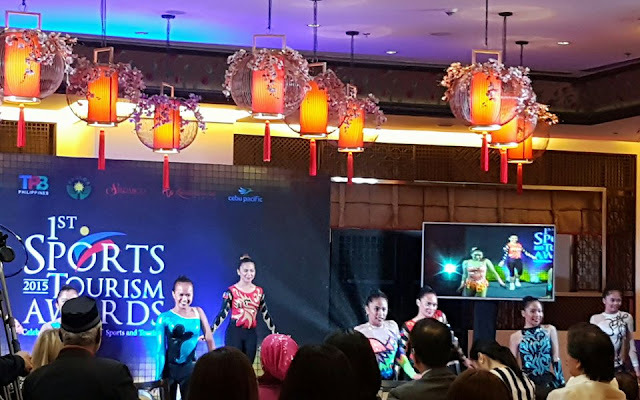 The first of its kind in the ASEAN region, the Philippine Sports Tourism Awards is made possible with the support of the Philippine Amusement and Gaming Corporation, Cebu Pacific, and Resorts World Manila.